Varanasi also known as Banaras or Kashi, is a city on the banks of the Ganges in Uttar Pradesh, North India, The spiritual capital of India. 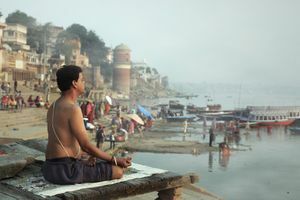 Varanasi grew as an important industrial centre, famous for its muslin and silk fabrics, perfumes, ivory works, and sculpture. Buddha is believed to have founded Buddhism here around 528 BC when he gave his first sermon. 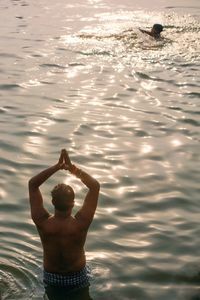 Varanasi has been a cultural centre of North India for several thousand years, and is closely associated with the Ganges. Hindus believe that death in the city will bring salvation, making it a major centre for pilgrimage. The city is known worldwide for its many ghats, embankments made in steps of stone slabs along the river bank where pilgrims perform ritual ablutions. Of particular note are the Dashashwamedh Ghat, the Panchganga Ghat, the Manikarnika Ghat and the Harishchandra Ghat, the last two being where Hindus cremate their dead. Dashashwamedh Ghat is the main ghat in Varanasi on the Ganges River. Every evening, as dusk descends, it's time for the Ganga Aarti It's a very powerful and uplifting spiritual ritual. An aarti is a devotional ritual that uses fire as an offering. 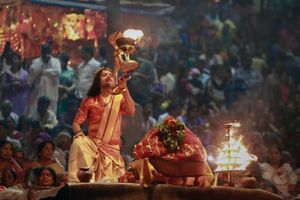 It's usually made in the form of a lit lamp, and in the case of the Ganges River, a small diya with a candle and flowers that's floated down the river. 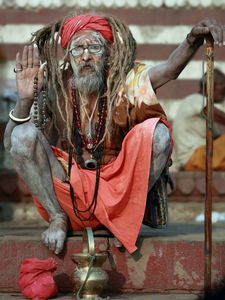 Lot of Sadhus visit Varanasi, Sadhus refer to renouncers who have chosen to live lives apart from or on the edges of society to focus on their own spiritual practices. Overall a visit to Varanasi is an experience of its own and worth it for it vibrant in nature and purely photographer’s paradise.